I’m clearing out the bathroom at the moment, ready for its demolition. Everything is going – walls, tiles, floor, bath, toilet, sink, radiator – and being replaced with a spanking new Villeroy & Boch dream room. I literally cannot wait – I may have to find a way of writing from the bath, seeing as that’s where I’ll be spending my time! Going through the hundreds of products that are crammed into every cupboard and shelf-space has made me do a quick evaluation of the things that I do like, and the things that are really quite useless. So you’ll be seeing quite a few haircare posts over the next few weeks, as well as shower gels and body scrubs, body lotions and face washes. 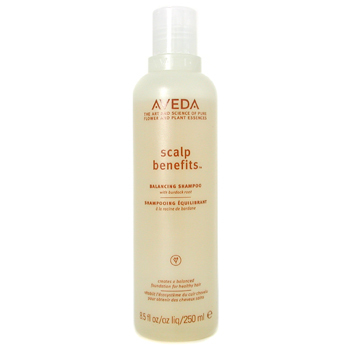 First set of products that are most definitely a ‘keeper’: Aveda’s Scalp Benefits. There’s a shampoo and a conditioner, both formulated to soothe your scalp and keep it healthy. I hate the word scalp; it reminds me of that bit in Last of the Mohicans when the baddy Indians go round with their knives, ripping the tops of people’s heads off. Nevertheless, I like this shampoo and conditioner. The shampoo gets hair very clean, doesn’t leave a residue, and it doesn’t irritate a sensitive scalp. It’s pretty effective at getting rid of gunky product build-up and gets rid of oily roots – I leave the shampoo on the scalp for a couple of minutes before rinsing off, and I’ve just read the instructions which actually recommend doing this! Check me out – I told you I’m a genius! The conditioner is light and you can use it all the way up to the scalp if you so desire. I tend not to, only because I already have a battle getting ‘oomph’ into my roots, but I did try it out once in the name of research, and it was fine, didn’t make my roots oily or anything like that. Many people have itchy scalps and dry hair and so it’s ideal to be able to treat both of these things with one conditioner. LookFantastic sells both the shampoo and conditioner at a cheaper price than the RRP – the shampoo is £12.35: http://tidd.ly/6e6a629c with free worldwide delivery.